The Rain Catcher Pilot Program (RCPP) is a comprehensive effort to integrate and leverage the City’s existing Green Stormwater Infrastructure (GSI) programs and resources. RCPP incorporates existing Watershed Protection and Austin Water discounts, rebates, capital funding, and educational programs with the goal of increasing the prevalence of cisterns and rain gardens that achieve both stormwater management and water conservation objectives. Modeling simulations indicate that there will be measurable improvements in the hydrology and aquatic life of our streams by capturing rainfall and letting it soak into the ground with rain gardens and cisterns. An extensive scientific modeling exercise selected the headwaters of Waller Creek as the pilot program location. This small urban area is 2.8 square kilometers (1.08 square miles) with 46% impervious cover (hard surfaces like driveways and roofs) and limited options for traditional stormwater controls. Historic stormwater monitoring data is available, as well as, ongoing water quality and quantity monitoring. Demonstration project sites within this area include Reilly Elementary School, West Skyview Road, several right of ways, and private homes. The incentive package for homes is being offered to 25 pre-selected homes in 2018 and will expand to a larger area in 2019. 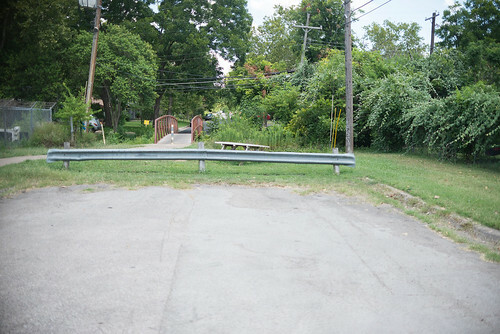 An extensive combination of demonstration projects (public land), residential and commercial systems (private land), and riparian restoration is planned throughout the upper portion of the Waller Creek watershed in an effort to develop the capacity to build distributed GSI and to evaluate the effect this effort has on the community and the watershed. There will be approximately 10 public property demonstration projects, mostly rain gardens in right-of-ways, but also an extensive installation at Reilly Elementary School, with large cisterns and six rain gardens. On private property, the Watershed Protection Department is collaborating with the non-profit Urban Patchwork and Austin Water’s Rainwater Harvesting and Rainscape rebate programs to encourage the installation of rain gardens and cisterns. The RCPP will initially focus on a small area of the community to test the hypothesis that greater financial incentives and technical guidance to community members will result in greater adoption of large volume cisterns and rain gardens (1500 gallons per property minimum). Fall 2018 – Fall 2019: Work with a focus group of 25 homes to get feedback on the pilot program and to test the educational incentive package. 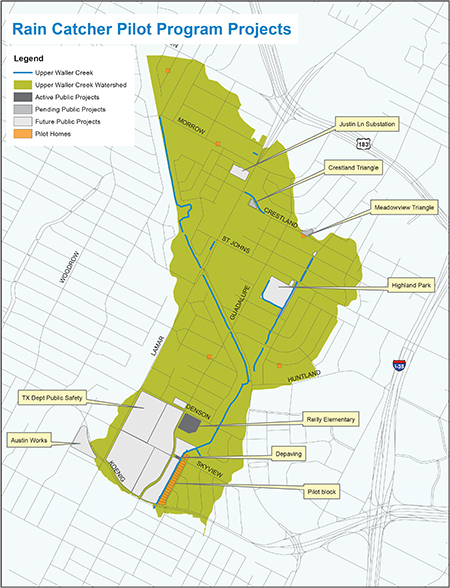 Late 2019 – 2022: Offer this educational incentive pilot program to more properties in the headwaters of Waller Creek area, analyze pilot program, and determine if it will be offered city-wide.